RAYMOND SCOTT: ON TO SOMETHING: "a biographical documentary by his son, filmmaker Stan Warnow, about the 20th century musician, composer, and inventor whose musical career included the swing era, electronica, and everything in between, including use of his music in Warner Brothers Looney Tunes and Merrie Melodies." THE KNOWLEDGE BOOK: "The integration of all our World Planet by becoming Unified on the Path of Humanity has been taken in hand by our Universal Friends. Celestial assistance is being granted to our Planet on this path. During this Transition Cycle ... Universal Attainments made by means of the Cosmic Influences cause our Planet to make a progress together with the medium it belongs to. The events being experienced cause all the Social Consciousnesses to awaken as a mass." Sun Ra obtained something he called "The Book of Information" while on tour in Turkey, and for years afterward he'd hand sections to those who helped the Arkestra spread their message (see Wire #78: The Mysteries Of Mr Ra). After decades of sleuthing, this legendary text has been positively identified with The Knowledge Book excerpts posted on the Turkish website of the World Brotherhood Union's Universal Unification Center. The Turkish word "bilgi" means both information and knowledge, so the titles are one and the same in Turkish. Yes, it is a message from space, but realistically, for our practical purposes and considering at stake is the very survival of humanity, does that triviality really matter? The Neurocritic: Wake Up and Smell the Coffee? : "When they examined their brains they found reduced levels of mRNA - messenger molecules that indicate when a gene is being expressed - for 11 genes important to brain function. 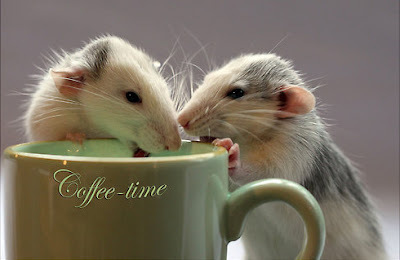 When the rats were exposed to the aroma of coffee, the mRNA for nine of the genes was restored to near normal levels, and pushed to above normal levels for two - GIR, involved in neuro-endocrine control, and NFGR, thought to control oxidative stress"
Is Scratch ‘n Sniff Starbucks in our future? -- this is only the first of many articles I have collected which seem to vindicate aromatherapy, a domain I would have once thought among the last to show any real scientific value, and mark my words there is an important lesson in science in that observation! Is Scratch ?? ?n Sniff Starbucks in our future? -- this is only the first of many articles I have collected which seem to vindicate aromatherapy, a domain I would have once thought among the last to show any real scientific value, and mark my words there is an important lesson in science in that observation! Creative Citizen: "Creative Citizen™ is a mental shift: humans don't always have to be users and abusers, they can also be creators. Instead of continuing down the same path of global unawareness and consumption, a Creative Citizen™ reduces worldwide problems to daily, personal solutions. Our goal here is to help each person see how little acts have truly big effects. Creative Citizen equips individuals and communities to move forward in the quest to become responsible global citizens. Instead of focusing on the fear induced by water shortages, expanding landfills, smoggy cities and the specter of global warming, we focus on one action at a time, knowing that a series of small actions can lead to massive results." The Senior Times Monthly: "the Arkestra follows the big band tradition but with an avant-garde twist, as likely to play When You Wish Upon a Star or There Will Never Be Another You as they are to revisit Sun Ra’s quirky themes like We Travel the Spaceways or one of the many tunes Allen has penned. Formed in the 1950s, the Arkestra is still thriving. I spoke to Marshall Allen, who still lives in the Sun Ra house in Philadelphia, a couple of days before his 84th birthday"
The SENIOR Times! I love it. Yeah, 84 years old, still world touring, still writing ripper new charts, still curating boxes of arrangements Sonny left behind, still leading the world's oldest and most venerable jazz band, and still atomizes any unwary terrestrial alto that may stray into the swath of his ion beam. Creative Citizen: "Creative Citizen??? is a mental shift: humans don't always have to be users and abusers, they can also be creators. Instead of continuing down the same path of global unawareness and consumption, a Creative Citizen??? reduces worldwide problems to daily, personal solutions. Our goal here is to help each person see how little acts have truly big effects. The Senior Times Monthly: "the Arkestra follows the big band tradition but with an avant-garde twist, as likely to play When You Wish Upon a Star or There Will Never Be Another You as they are to revisit Sun Ra?? ?s quirky themes like We Travel the Spaceways or one of the many tunes Allen has penned. Formed in the 1950s, the Arkestra is still thriving. I spoke to Marshall Allen, who still lives in the Sun Ra house in Philadelphia, a couple of days before his 84th birthday"
How Sugar Changed the World: Heather Whipps writes "It's unlikely that many candy-lovers in the United States think about history while quaffing an estimated 100 pounds of sugar per year, but sweet stuff once played a major role in one of the sourest eras in modern times. White Gold, as British colonists called it ... Profit from the sugar trade was so significant that it may have even helped America achieve independence from Great Britain." we're often told of the Caribbean slave trade, both african and Cromwell's 'black irish' slaves trucked into the Americas, but they never seem to mention just what it was all those plantation slaves were actually doing. Stoking the boilers on a whopping one-third of the the western world's economy, that's what! Polling the Crowd Within: "the average of two guesses for any individual participant was better than either guess alone, regardless of the time between guesses. So polling the “crowd within” does indeed yield a statistically more accurate answer. What’s more, this internal crowd gets more independent-minded with time: Contestants who were asked to second-guess themselves three weeks later benefited even more by averaging their two guesses than did those who second-guessed themselves immediately.”"
Polling the Crowd Within: "the average of two guesses for any individual participant was better than either guess alone, regardless of the time between guesses. So polling the ?? ?crowd within??? does indeed yield a statistically more accurate answer. What?? ?s more, this internal crowd gets more independent-minded with time: Contestants who were asked to second-guess themselves three weeks later benefited even more by averaging their two guesses than did those who second-guessed themselves immediately.???" 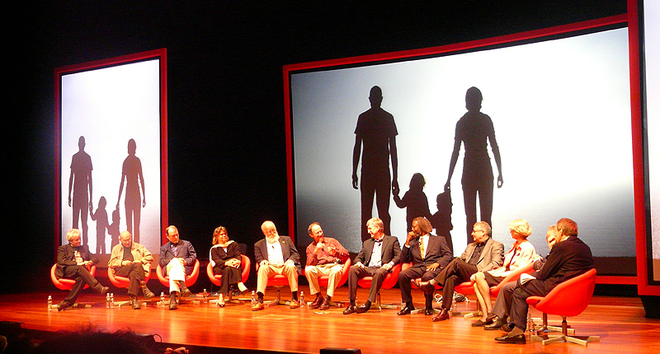 A Review of the “What does it mean to be human?” panel at the 2008 World Science Festivalt: 10 top scientists on a panel held at this year’s World Science Festival in New York City, 10 answers to the question, 9 of them wrong. Amis described the opening of Kafka?? ?s ???Metamorphosis,??? with the hero discovering that he has been changed into a bug, as the best literary representation of a hangover. how sad and shocking, that here in the 21st Century 'grimy' old-world Italy cities could provide free public water everywhere while in 'pristine and natural' Canada, even if we convinced the paranoids to offer the water, it would be so laced with 'protection' chemicals no one would want to drink it! "If someone ever asks you, what is rock n roll? Rock 'n' roll pioneer Bo Diddley, who banged out hit songs powered by the relentless "Bo Diddley beat" that influenced rockers from Buddy Holly to U2, died on Monday at the age of 79. RIP? Like I told uglyrug, t'ain't nobody gonna RIP no more no how no way. Bo Diddley is there! Toss the harps and hymns 'cause they gonna rip it up now! Jazz is a conversation, and a friendly debate is a perfectly viable way to communicate; here it is Joshua Redman and James Carter backed by a big-band arrangement of Monk's "Straight No Chaser" in a great display of the quaint old custom known as "Trading Fours". The rules are simple: folk-song structures tend to have phrasings given in groups of four bars of four beats, so the soloists take turns, most often at a break-neck rate, each taking what the other has put forth, and taking it up a notch. It's a time-honoured mainstay of the jazz culture, maybe not so noticable in the harmolodic free-er jazz styles (tho still appears now and then) and often used in performances for the finale showpiece. The practice probably has its roots in early jam-session playing in the New Orleans bands or maybe before. The earliest I can dimly recall are in Louis Armstrong days, probably because the music was far more arranged for King Oliver's day; trading fours was honed to a fine art by Bird and Diz, and while it started to fade with the Miles Davis Quintet's ensemble-improv style and on through the Free Jazz bands, it still lives on strong in the Sun Ra Arkestra shows where it can sometimes be staged like a kaiju battle! There's been cross-overs too, with bluegrass bands trading fours and I suppose the custom also persists into the modern day rap poets trading fours in rhyme or in beat-control switching back and forth between DJs. MMM: Revolution 9 Response: "A French-horn player whimpered like a newborn into one microphone, as a violinist murmured through a trumpet mute into another mike so that her voice sounded watery and indistinct. A percussionist smashed and stirred a bagful of broken glass with a hammer, and a clarinetist blurted the tune to “There’s a place in France / Where the naked ladies dance.” A sober young man, unaccustomed to performing, wielded one of those old-fashioned squeezable car horns and in an impassive baritone kept repeating: “Number nine … number nine.”"
Brain Power: 100 Ways to Keep Your Mind Healthy and Fit: "Whether you are 25 or 75, it's always a good time to think about ways to keep your mind healthy. People with strong minds live a richer and more fulfilling life. The following list incorporates plenty of mental, physical, and nutritional ways to keep your mind sharp throughout your lifetime. You are sure to find some great ideas you can start doing today." When they call the plan "Brain Power" the first thing that comes to mind is some sort of patented snake oil, but in this case it comes from the Online Education Database, and while you'll find Goji Berries and Matcha, the list also includes such essential nutritious supplements as "Call your mom." MMM: Revolution 9 Response: "A French-horn player whimpered like a newborn into one microphone, as a violinist murmured through a trumpet mute into another mike so that her voice sounded watery and indistinct. A percussionist smashed and stirred a bagful of broken glass with a hammer, and a clarinetist blurted the tune to ???There?? ?s a place in France / Where the naked ladies dance.??? 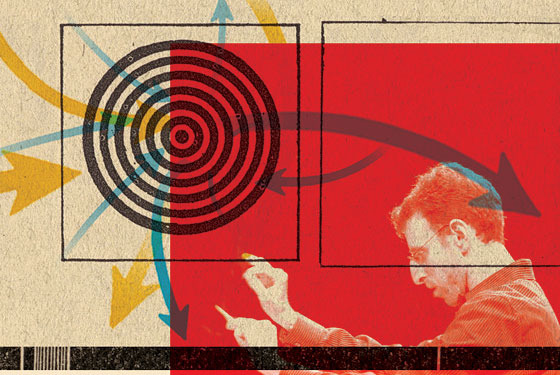 A sober young man, unaccustomed to performing, wielded one of those old-fashioned squeezable car horns and in an impassive baritone kept repeating: ?? ?Number nine ??? number nine.???"